The red-brown wood of the Wild Cherry or Gean as it is known in Scotland is used in cabinet making and for musical instruments and pipes. As its own fruits tend to be bitter, it is one of the parents of most european cultivated cherries. It is one of the most attractive of our native, woodland trees, in time this becomes a medium to large tree with a broadly rounded form. Its white flowers in spring are followed by foliage which commonly exhibits good autumn colouring of red and gold. 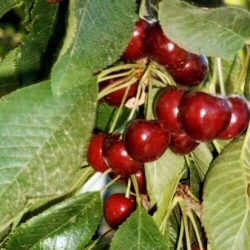 Our Wild Cherry or Gean or Mazzard trees are supplied at a height of between 150 - 200cm a 7-12 litre container for year round planting and better results than from either bare-root or root-balled stock.